The new Border Wait Time app from U.S. Customs and Border Protection (CBP) is a one stop shop for cross border travelers, displaying estimated wait times and open lane statuses at U.S. land ports of entry. Travelers can also locate ports of entry closest to their location, and then map the best route to the crossing of their choice. For example, the app allows travelers in the Buffalo, New York, area to compare wait times at the Peace Bridge, Rainbow Bridge and Lewiston Queenston Bridge and will then direct them to whichever crossing they chose. Wait times for pedestrian, passenger and commercial vehicle crossings are broken down by lane type (standard, SENTRI, NEXUS, FAST, Ready Lane, etc.). Check out the app’s frequently asked questions section for an explanation of the different lane types, and other helpful hints on using the app. Travelers can also bookmark their favorite ports of entry within the app for easy reference. 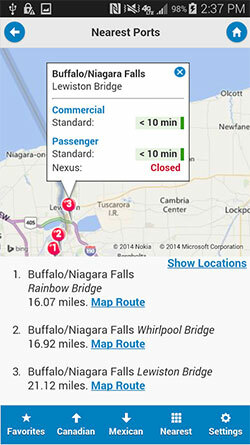 Border wait time data automatically refreshes in the app every 60 minutes by default. However, you can manually refresh the data as needed within the app’s settings. The border wait time estimates are either collected manually or electronically at each CBP port of entry, using line-of-site methodology via predetermined benchmarks, or an automated system. The CBP Border Wait Times app is available for both iOS and Android-based devices in the Apple App Store and Google Play store. The app does not require you to register or provide any personal information. CBP does not store or have access to any information regarding travelers using the app, according to the agency. CBP is a component of the Department of Homeland Security and provides security and facilitation operations at 328 ports of entry throughout the country. The agency is charged with keeping terrorists and their weapons out of the U.S. while facilitating lawful international travel and trade. _You can download this and other cool mobile government apps with just a few clicks from our USA.gov Federal Mobile Apps Directory. 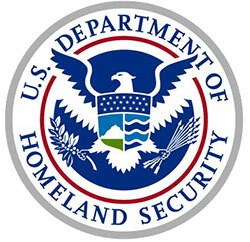 Federal agencies can get their apps in the directory by using the The Federal Mobile Products Registry_.